Wine glass markers, those faddish hoops used to identify stemware at parties, are already incredibly trite and tacky. However, with some ingenuity they can be made even worse. These are so simple and inexpensive to make that there’s no excuse to not whip up a batch. Keep some on hand for last-minute hostess or birthday gifts; your kind gesture is certain to be remembered for a long time to come. Notice that these hoops have a flat area at one end, which is just barely visible in our photo. Snip this off with your pliers. There are an amazing variety of beads these days. We’ve even seen a bead which represents a small metal outhouse, complete with a door which opens and a small seated figure which tips out when jostled. 1. 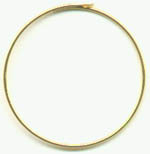 Using your needle-nose pliers, bend a loop in one end of an earring hoop. 2. Thread on your beads and flotsam as desired. 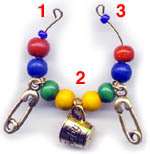 Here we’ve chosen a baby theme with safety pins and beads in primary colors. 3. Once satisfied with your design, bend a loop in the other end of the earring hoop to prevent the beads from sliding off. Here are a few of our ideas. “Form follows function.” Why not be frank about what you’re really feeding your guests? 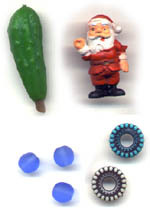 These charms use alphabet beads readily found at bead or craft stores. These beads would also work well for making charms with people’s names or nicknames. Since the fly didn’t have a hole in its body, we had to drill one in order to insert the wire hoop. 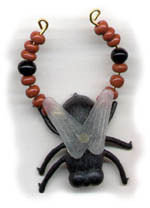 The brown and black beads represent flyspecks. 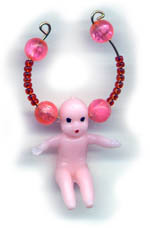 Like the fly, we had to drill a hole through this tiny plastic baby’s head in order to insert the hoop. Of course, using whatever materials you happen to have on hand can yield astonishing results. Make a charm from random flotsam and see if people can guess its theme!